My product is printing blank pages. What should I do? Several factors may cause the product to print blank pages, such as print settings, low ink, or the product itself. Make sure the product is placed on a flat, stable surface that extends beyond the base in all directions. The product won't operate properly if it's tilted or at an angle. If the ink cartridges are old or low on ink, you may need to replace them. Make sure the yellow tape was removed from the ink cartridge(s) installed in your product. Make sure you're using paper that meets the product's specifications. Note: Transparencies and vellum paper are not supported. Try printing again. If your print job prints correctly, the problem was solved. If the copy is blank, print a nozzle check pattern to see if any of the nozzles are clogged. Clean the print head, if necessary. Make sure the paper size, orientation, and layout settings in your printer software are correct. Make sure your document does not contain blank pages. If your printer software has a Preview option, you can check for blank pages before you print and remove them, if necessary. If you're printing from Windows or a Mac, you can select Skip Blank Page in your printer software. To select the setting, follow the steps below for your operating system. Windows 10: Click and select (Settings) > Devices > Printers & scanners. 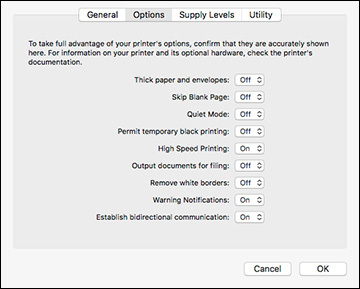 Select your printer and select Manage > Printing preferences. Windows Vista: Click and select Control Panel (or point to Settings and select Control Panel). Select Printer (under Hardware and Sound) or Printers. Right-click your printer and select Printing Preferences. Click the Maintenance tab and click the Extended Settings button. Open the menu and select System Preferences. Select Print & Scan, Print & Fax, or Printers & Scanners, select your product, and then select Options & Supplies. Set Skip Blank Page to On.